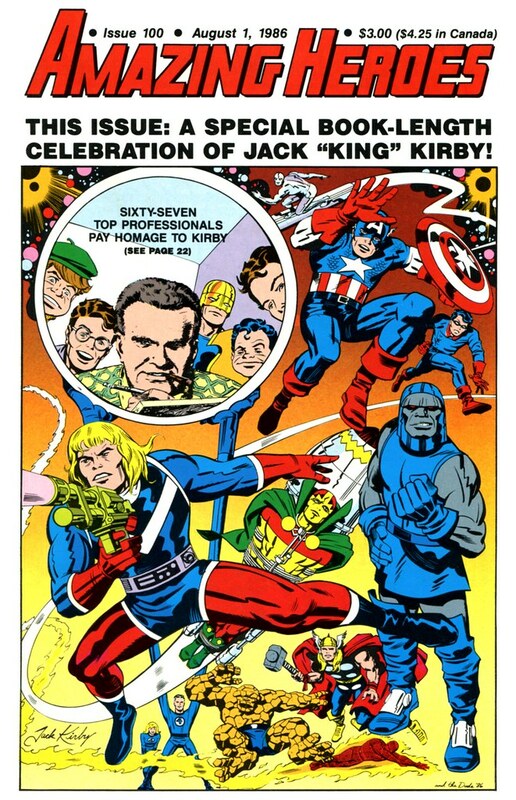 Today is Jack Kirby's birthday today and we Giant-Sized Geeks celebrate this the way others do any religious holiday. 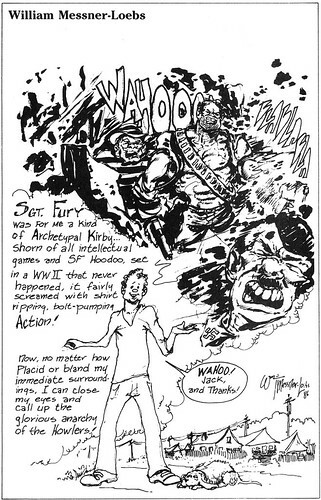 Kirby was a God among comics creators! That fact entitles you to sit back and read a few Kirby comics today. There have been a lot of publications about Jack Kirby that honor his contributions to the comic industry. One of my favorites was Amazing Heroes #100 (from 1986). It featured a great cover by Jack Kirby, inked by Steve (The Dude) Rude. This issue of Amazing Heroes was jam-packed with content. It had an article by Mark Evanier and a series of written tributes to the King by industry professionals, such as Frank Miller, Jerry Ordway, Steve Rude, Stan Lee, etc. A few of the artists contributed some drawings. Probably one of the most touching tributes was William Messner-Loebs contribution. Messner-Loebs was the writer-artist who did Journey: The Adventures of Wolverine MacAlistaire, and later wrote many other comics like Flash, Impulse, and Comico's Jonny Quest. In this cartoon, he expresses his love for Sgt. Fury and the Howling Commandos: Now, no matter how placid or bland my immediate surroundings, I can close my eyes and call up the glorious anarchy of the Howlers! I feel the same way about various comic-book characters. Messner-Loebs fell into a bad financial situation in the early 2000s, but according to the Wikipedia article, he is doing better now. I hope so. 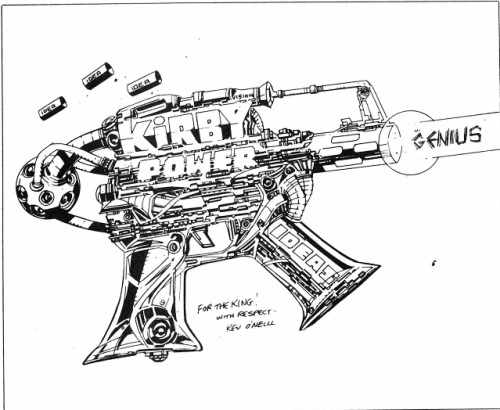 Kevin O'Neill, the artist most of you will know from League of Extraordinary Gentlemen, drew this fantastic gun on steroids, powered by Kirby, pumping out idea bullets and spewing genius. I swear I saw Marshal Law carrying this weapon, I'll have to re-read those issues to look for it. Scott Shaw! delivered this cartoon giving a mighty big hand to Jack. Scott Shaw had a website called Shaw Cartoons that you can visit. Both O'Neill and Shaw are recognizing Kirby's skill at taking any object and blowing it up, making it larger than life. 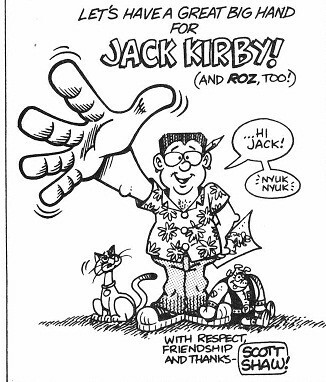 What was extra nice was that Scott also gave a shout out to Kirby's wife, Roz. 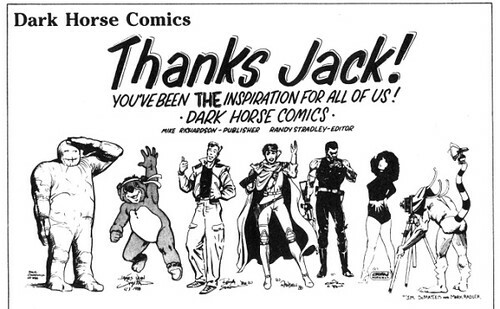 Dark Horse Comics lined up their stable of artists to provide a little jam tribute to the King. The most notable artists here are Paul Chadwick, who drew his creation, Concrete, on the left. In the middle, I see Ron Randall's Trekker character. I wish I could name all of the rest. I was inspired to explore Amazing Heroes #100 after visiting The Kirby Museum. Check it out, I think you will find lots of Kirby magic there. Nuff Said!